For the locations of buildings and facilities, please see the NTU campus map. The Computer and Information Networking Center provides 24-hour computer rooms. Students must use their ID cards to pass the gate control. Users can surf the Internet and run various kinds of application software. Both black and color laser printing is supported. We grant each student TWD 100 for free printing each semester. Once this free quota is used up, students must pay for printing. Browsing pornographic web sites or playing games is prohibited. Violating the rules will result in the suspension of access rights. Every student at NTU possesses 300 MB of web space, and an e-mail account in the form of “student ID number@ntu.edu.tw.” As all important school announcements and academic information will be sent to this account, please make sure you have access to this account and check your mail box regularly for your own benefit. To activate your account and modify the password, please refer to changepassword.cc.ntu.edu.tw ( Your account is your student ID number, such as b95101001, starting with a lowercase letter. Your password is preset as "a" plus your "birth date", such as "a + MMDD". ) This is also the account which you will use to authenticate several online services at NTU. Faculties, staff and students of NTU can access the NTU campus wireless network. To gain access to the “ntu” network, log in with your NTU e-mail account and password. You will need to log in each time you would like to connect through this network. To gain access to the "ntu_peap" network, a separate registration with another username is required. Unlike the “ntu” network, your device will automatically connect to the “ntu_peap” network after configuration. The University Library System comprises 6 major branch libraries, including Main Library, Social Sciences Library, Law Library, Medical Library, Gallery of NTU History, and Taiwan Indigenous Peoples Recource Center. Main Library is the main and the largest library on campus. In addition to libraries located at the Main Campus, Medical Library located at the Downtown Campus is also open to all students. Some departments such as Department of Mathamatics, Department of Physics, and Institute of Biochemical Sciences have their own branch libraries. For more information, visit NTU Library. NTU provides a variety of sports facilities, including a track and field, as well as courts and sports grounds for basketball, football, volleyball, badminton, tennis, baseball, softball, handball, etc. NTU students can borrow basketballs, volleyballs, badminton racquets and birdies, and other sports equipment by temporarily turning in their student ID card at the Gymnasium. The sports center also provides a large number of high-end indoor sports facilities, including a weight training room, badminton courts, table tennis courts, dance rooms and basketball courts, and a heated swimming pool. For the locations of the sports facilities, please refer to NTU campus map. Most international flights land at Taoyuan International Airport (TPE). The journey from Taoyuan International Airport to central Taipei is about 40 kilometers. 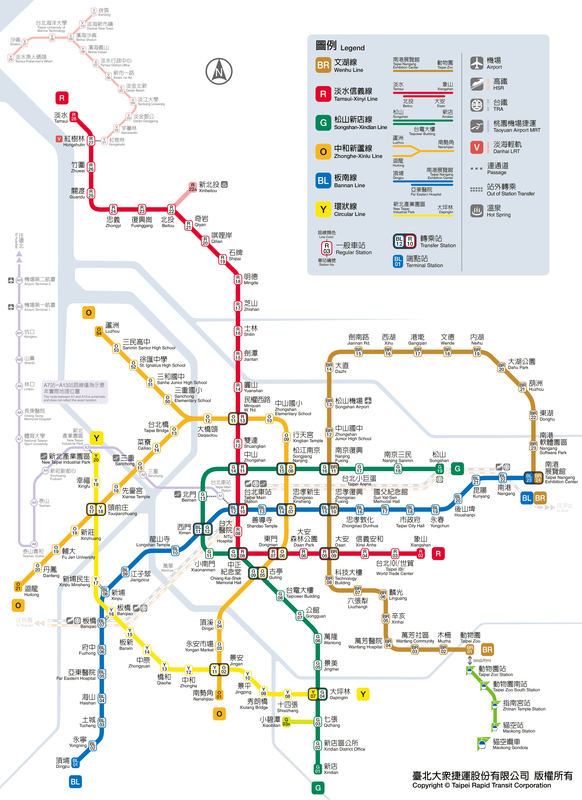 The Taipei MRT ( Mass Rapid Transit ) is a modern transportation system serving the city and its vicinities. Currently there are ten routes. NTU is at the Gongguan station on the Danshui-Xindian line. Students can take the MRT at the Gongguan Station on Roosevelt Road. NTU Student ID Cards can function as MRT's EASYCARD. You can add value directly onto your NTU Student ID Card at all MRT stations and convenience stores ( ex：7-Eleven ). Buses in downtown Taipei can bring you to more places than the MRT. Where and how to get a bike? If your bike is towed because of illegally parking, please go to “Bicycle parking management center” to search for your bike, and go to the Shui Yuan bicycle towing area to claim your bike. If you don't want to purchase a bike, you can rent a “YouBike” offered by The Department of Transportation, Taipei City Government. All you need is an “EasyCard” ( i.e., your student ID card ) to rent a YouBike. A few weeks after final exam, you can search for your grades at Grades Inquiries in myNTU system with your myNTU account. If your instructor hasn't submitted grades yet, you won't be able to look up your grade for the class. However, all grades should be available before the end of winter or summer vacation. If you need a hard copy of your transcript, you have to go to the printing machine in front of the office of academic affairs in the first administration building to pay and print your transcript. To log-in and operate the printing machine, you need to enter your student ID number and your password ( four digits of your birthday：MMDD ). If you are an exchange student or a visiting student from China, OIA will send 2 copies of your official transcript ( one for you and one for your homeuniversity coordinator ), in both Chinese and English, to the international office at your home university. If you are a visiting student, the OIA will send 2 copies of your official transcript in both Chinese and English to the mailing address you gave when you applied. If you are considering a leave of absence, please login to MyNTU , click the student leave management icon and follow the procedures step by step. In case of a medical emergency, dial 119; in the event of a fire, dial 110. Please take traffic time into consideration. You are advised to call the 24-hour language assistance hotline ( 0800-024-111 ) if you have difficulty communicating with 119 or 110. After calling 119 or 110, please inform the university about your emergency. They will respond to you around the clock. There are several lost-and-found stations located around campus. If you can recall where you lost the item, report to the nearest station to search for it. If you have no idea where the item was lost, please frequently check NTU Campus Announcements to see if your lost item has been found, and report the incident to the Campus Security. If you have lost your ARC, please go to the National Immigration Agency with your passport, student ID card, a photo 2 x 2 inches (51 x 51 mm) in size, NTD 500 cash, and a declaration of Loss of ARC form or a crime report from the police station. For more detailed information, please refer to the National Immigration Agency's webpage about obtaining a new ARC card. If you have lost your post office ATM card, please immediately proceed to a post office (or the Customer Service Center) to cancel the card. Meanwhile, apply for reissuance of the ATM card ( NT$100 handling charge ), or termination of your account, at any post office. For more information, please refer to the post office's website. If you have lost your health insurance card, please go to any National Health Insurance Administration regional division with your ARC and NTD 200 cash. The application process should take about 30 minutes. For addresses of regional division offices and more information, please visit the website for the National Health Insurance Administration Ministry of Health and Welfare. In order to provide more effective service, we created a Facebook group, NTU International Students. If you, as an international student, would like to have an inside view of what life in Taiwan is, meanwhile knowing more about politics, history, economy in Taiwan, or other aspects of Taiwan's society, then you certainly have to participate in the activities organized by Taiwan Host family Program. Currently, NTU has more than 400 student clubs in operation, comprised of 8 different types of clubs：self-governing, academic, entertaining, servicing, social development, group activity, physical training, art and sports teams. For more information, please go to the Student Activity Division website. NTUFSA consists primarily of international students but also welcomes exchange students. NTUFSA arranges orientation days and regularly holds fellowship activities to help new international students adapt to the environment and interact with each other. During the semester, NTUFSA and NTUISIS organize short field trips, sporting events and holiday celebrations. NTUISIS is a volunteer group of NTU students who help international students integrate into campus life and facilitate cultural exchanges with local students. NTUISIS offers assistance with dorm move-in, registration, and introduction to campus life. NTUISIS partners with OIA and NTUFSA to hold cultural interaction activities. Every semester, NTUISIS holds a day trip for international students to experience local culture. NTUISIS also holds lectures on international affairs to enhance communication among club members and broaden the knowledge of local students. The post office provides both postal and banking services, including shipping and receiving, deposit and withdrawal, etc. Post offices are available on Campus ( 1F in Xiao-Fu ) and at the MRT Gongguan Station. To open a financial account in the post office, you should bring the original and a copy of both your passport and ARC, and at least NTD 100 for a deposit. To open a bank account, bring the original and a copy of both your passport and ARC and at least NT$100 to the bank for the procedure. It is strongly recommended that you apply for an ATM bank card, so you can use it to withdraw money from ATMs at any bank anytime. ATMs can be found on the street and inside many convenience stores in Taipei. If you need to exchange foreign currency into New Taiwan Dollars( NTD ), please keep in mind that most banks only have USD, HKD and Japanese Yuan available. Only the head office of Taiwan Bank offers other currencies. You are required to bring your passport and ARC in order to exchange foreign currencies. ext to the Lu Ming Hall ( 鹿鳴堂 ) on NTU campus. Please refer to NTU campus map.